An employee awards dinner is an important way for companies to encourage great work and foster healthy competition among their employees. Generally, awards dinners allow employees to bring close family members and friends to watch them receive an award, eat a nice dinner, and then go home. To break up the monotony, consider some innovative ideas to help enliven your employee awards dinner. Most employee awards dinners will have some sort of entertainment. Consider renting a band to entertain the employees and guests before and after the awards presentation. If you are planning an upscale event, you can hire a jazz band. For a more laid-back event, consider a cover band or a DJ. To add something different to your awards dinner, consider hiring a comedian to host the function or do a 15- to 25-minute set. The comedian could even present funny awards to the employees like "The Employee Most Likely to Steal the V.P. 's Parking Space." For a more intimate awards dinner consider keeping the attendants to a minimum. Sit everyone close together at one table, or a few tables that have been moved together or close to one another. Remove the stage, and instead have all presenters sit at the same table(s) and speak from their seats. You can also move your event outside around a nice hotel pool or at a nice park. You probably want to make sure you have adequate shelter to keep insects and unexpected weather conditions at bay. During hard economic times, an employee awards dinner may seem like an extravagance. You can cut costs by removing alcoholic beverages, renting a DJ rather than having live music, restricting the guest list to only employees, or by asking each employee to bring a food dish. 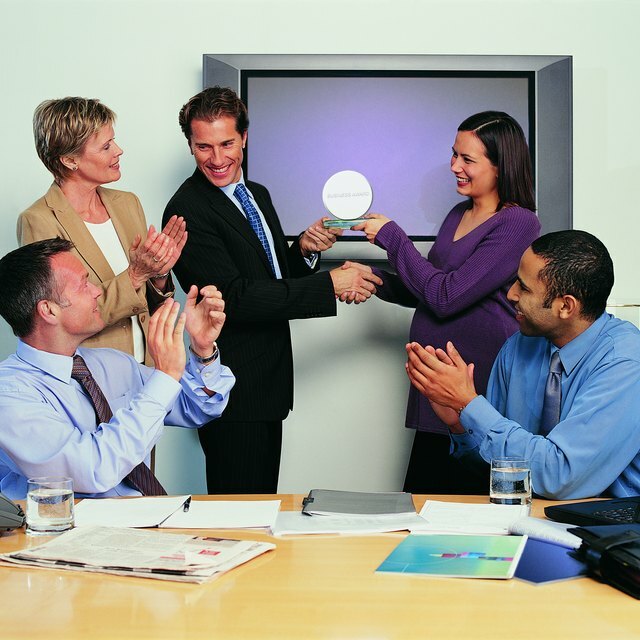 To make your employee awards dinner more interactive, set up some activities like a game show, a raffle or team building exercises. You can have a few people volunteer to play an employee version of "Family Feud." You can pit different departments against each other and pick topics that are work- and job-related. You could also help foster teamwork by doing some team-building activities. Make every employee get up and sit next to someone new. This will break them out of the cliques that have a tendency to develop in the workplace. Or give each attendant a worksheet and make them find an employee whose middle name starts with "E," or who drives a Miata. The winner can get a nice cash prize.